Unifor National President Jerry Dias addresses the media on Tuesday, Jan. 8, 2019, in Windsor, Ont. General Motors Co. has rejected proposals by the Unifor union to save 2,600 jobs and continue auto production at GM’s Oshawa assembly plant, scheduled to close at the end of 2019. Executives of the automaker delivered the news to union leaders at the company’s Detroit headquarters in a meeting on Tuesday afternoon. Colin James, head of the Unifor union at the plant, said he was “devastated” by the confirmation of the shutdown. 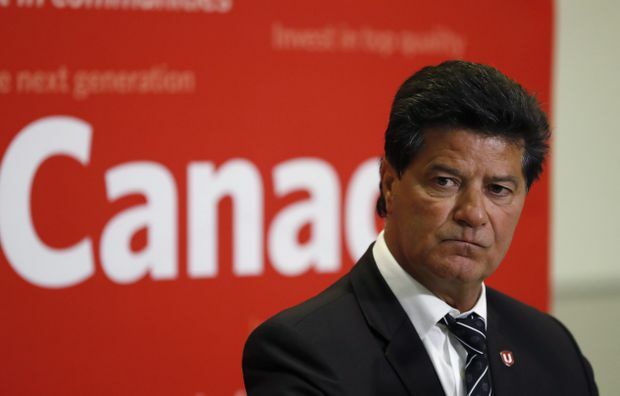 Jerry Dias, president of Unifor, said he was “deeply disappointed” by the company’s rejection of the union proposals presented in late December. He said GM is ending production in Oshawa so it can save labour costs by shifting work to low-cost Mexican plants. In December, Unifor leaders presented executives with GM with several ways they said could save the plant, including extending production of currents models and moving other vehicles to the Oshawa plant. One such vehicle is the Chevy Blazer, made in Mexico. But they received a “no” in a meeting at the automaker’s headquarters on Tuesday afternoon. David Paterson, spokesman for General Motors, said the proposals had already been considered and rejected by the automaker. None of the options were economic, he said by phone. GM said on Nov. 26 it would close the Oshawa assembly plant and five other factories by December, 2019, eliminating more than 6,000 hourly jobs on top of thousands of salaried positions to save US$6-billion a year. The GM shutdowns include assembly plants in Warren, Ohio, and Detroit, and parts factories in Maryland and Warren, Michigan. In addition, GM is closing plants in South Korea and two other overseas locations. The closings come as GM discontinues sedans and focuses on better selling and more profitable trucks and crossovers. The company is also investing in electric and autonomous technology. The Oshawa plant east of Toronto employs about 3,000 people and produces the Chevrolet Impala and Cadillac XTS, poorly selling sedans that are to be discontinued. The plant also finishes two older GM pickups, the Silverado and GMC Sierra, which are being updated and are made in the U.S. and Mexico. Greig Mordue, a professor at McMaster University and former Toyota executive, said he was not surprised GM did not change its plans. He noted any move to bow to Canadian pressure while closing U.S. plants would be received negatively in the United States. However, Prof. Mordue said he was surprised GM offered no guarantees of extended or continued production at its plant in Ingersoll, Ont., which makes the Equinox model, a car also made in Mexico. “At some point in time, these car companies are all going to make all these cars in Mexico,” he said in an interview. The Oshawa plant has been running at one-third capacity after the loss of models that include the Chevrolet Camaro and Buick and other models. As recently as 2003, the Oshawa complex churned out 940,000 vehicles a year – one-third of Canada’s auto production – and employed 11,000 people. In 2017, GM in Oshawa produced 100,000 vehicles. After the shutdown was announced in November, Unifor launched a campaign to put pressure on GM to reverse its decision. The union is running ads that accuse GM of “corporate greed,” shifting production to Mexico after being saved by an $11-billion bailout from Ottawa and the Ontario government in the financial crisis of 2008-09. “Hey GM, you want to sell here, build here,” is the campaign’s tag line. Mr. Paterson said the government bailout helped prop up the economy of Southern Ontario, ensured GM could pay up the pension plan and helped it develop a software and technology centre in the province. “We’re not going anywhere,” he said.